Damselfish belong to the Pomacentridae family. Most available fish belong to one of the following genera: Abudefduf, Dascyllus, Chromis, Chrysiptera, Paraglyphidon, Pomacentrus, and Stegastes. Damselfish are closely related to Clownfish, which are also a member of the Pomacentridae family. Damselfish are found throughout the world, and are almost always associated with coral reefs. The average size of most Damsels in captivity is around two inches, but in the wild the largest member of this family reaches over 14 inches in length. Damselfish are often used to break in or cycle a new aquarium. It is important to remember that even though these fish are hardy and can handle the adverse conditions of a new aquarium, they may become quite aggressive among themselves, and toward other tankmates. Most of these fish stay in small shoals in the wild when young, breaking away from the group as they grow, and eventually become solitary as adults. When dealing with several Damsels in one aquarium, plenty of rockwork and hiding places are necessary in order to keep quarrels to a minimum. 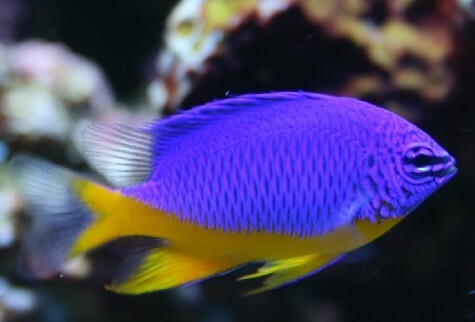 The Chromis are a genus of Damsels that are schooling fish. They do well in captivity in groups of the same species. No significant markings or distinguishing characteristics differentiate males from females. Damselfish can be successfully spawned in captivity. The male Damsel is usually responsible for the care and maintenance of the eggs after the fish have spawned.